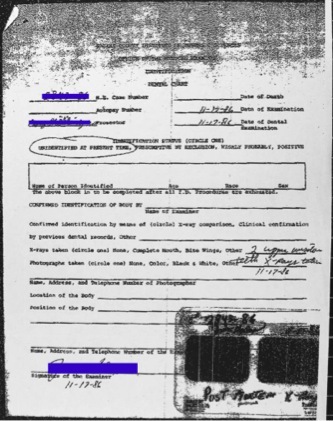 When doing an ID using dental records, we need to have both: (1) dental records from the unidentified decedent in the morgue, and, (2) known dental records of the putative victim for the comparison (if one were being nit-picking, the unidentified person could just as well be living, though I have never performed a dental ID on a living individual). I will obtain the dental profile of the deceased person here in the morgue. The known dental records of the putative victim will normally come from the person's dentist--and obtaining the antemortem records is most often the most difficult part of the entire process. In order to locate the deceased person's dentist, we must have a little bit of information about the putative victim so that we can talk to family/friends and, we hope, locate the dentist's office. We are often asked how long it will take to complete the ID process on a particular individual, and, of course, that is a question not easily answered--it just "depends." If we are lucky and do find the dentist, and the dentist does have the records we need, I will normally call and make arrangements to get those records myself. If the dentist is local, I'll usually just drive over to the office and pick the records up in person. But if the dentist is far away, we may have to make other arrangements. Many offices have digital radiography now, and in that case it is pretty simple for the office to just e-mail the images we've requested. But, in many cases, the records we are looking for will be film-based, and then it might be a bit more difficult to send those long-distance. Sometimes the office will want to simply mail the records to us, but, frankly, that just takes too long--please consider that there's a family waiting for us to complete the examination and ID. They cannot do much at all until the ID process is completed--they don't want to believe the deceased is their loved one, they don't want to start making final arrangements, and they don't really begin the grieving process until they know for sure who the decedent actually is. So, please, "snail-mail" is not the best route to go. Instead of mailing records, we often ask for offices to submit the records to us electronically. Fig. 1. We receive the known radiographs for comparison from the dental office, and then we make radiographs of the decedent here at the morgue. We appreciate receiving quality films such as the ones here labeled "known radiographs." One nice way to send images of radiographs is fairly easy for the dental office. The radiographs can be put on a radiograph viewer and photographed with a digital camera, and the resulting image sent via e-mail. Now, we very probably will still ask for the originals, but at least we can get started on the ID. 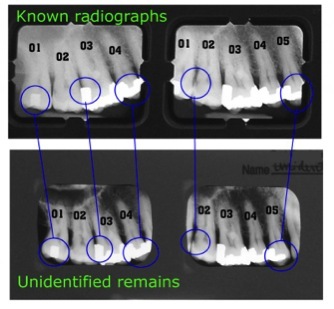 That's how the top image of known radiographs in Figure 1 at left was sent to us. 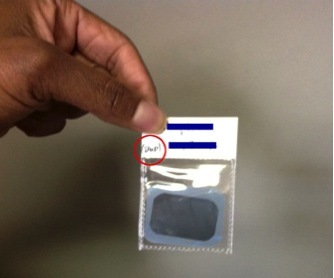 Now, not visible in this particular cropped image is the patient's name and the date of the radiographs that were present on the film holder--and that information is critically important to us. We also must have indication of either the location of the "dots" so we can determine orientation of the films, or the office should clearly mark "R" and "L" for us so there's no confusion about which teeth are which. Please also make sure the exposure is good for the images, because if too much of the lightbox is included, the camera's meter will take that into account and underexpose the radiographs. If possible, also please use a high-quality camera with a good macro ("close-up") lens. And, please, send ALL images you have, not necessarily just the most recent. I actually had an office tell me one time "We don't have anything recent that would help you. All we have is a pan and and six BWX from last year." Well, let me tell you, for a forensic odontologist, that's just about as good as gold. Fig. 3. Faxing radiographs just doesn't work. Images of radiographs can also be sent via a scan from a high-resolution scanner with transparency adapter--but note: image in Fig. 3, above, was sent to our office via fax machine and this is also how scanned images on a regular flat-bed scanner without a transparency adapter will look. Not helpful. Fig. 4. Above--duplicate radiographs as received from an office. This is a piece of photographic paper such as we used to use back in the olden days to print photos. The film holder with radiographs was simply laid on the paper and then exposed to room light, and the paper then was developed. The images are tonally inverted, and it appears the emulsion on the original films was seriously damaged in some way. Again--helpful? Not very much. In addition, from these particular duplicates, I cannot see the "dot" and so cannot orient R and L properly--so I do not really know which teeth are which, and, further, the patient's name and date of exposure are not on the duplicates. Not very useful. Fig. 5. Below--an image such as this can help us a lot. Patient's name is included with the image as well as date radiograph was made. The orientation "dot" is visible and also the "ULT" designation on the film can be read so we may determine correct right-left orientation. 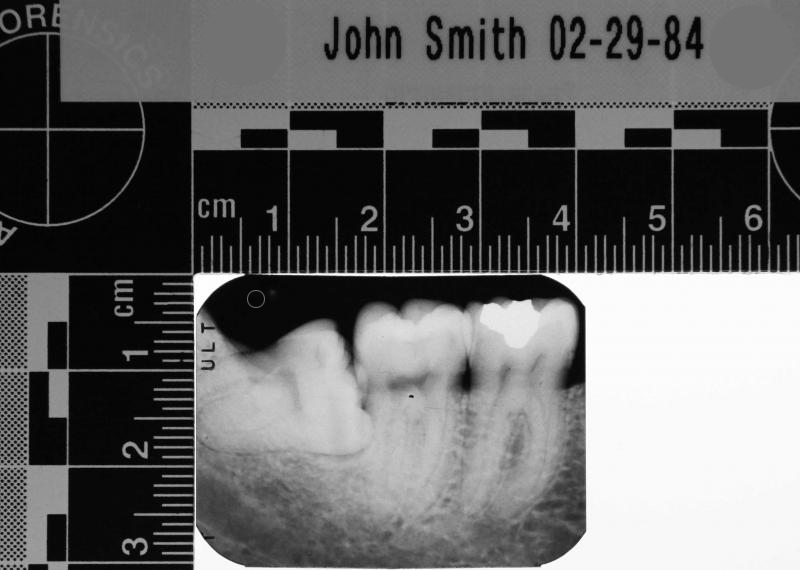 This image was photographed with the radiograph simply placed on a standard lightbox. Clinical photographs can be very helpful at times, as well. Fig. 6. 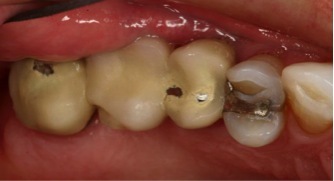 Above--clinical photo of putative decedent from dental office. Fig. 7. Below--photo of corresponding fragment of remains. Fig. 8. Above--Chart as received from a dental office. The two odontograms are mirror images of each other--and are supposedly of the same patient. The office manager told me they were simply not sure which way was the correct charting, so they sent it both ways. Helpful?--not so much. Fig. 9. Below--we run into non-standard charting all the time. The diagram below is an odontogram that was in use in this very office before I started working here. 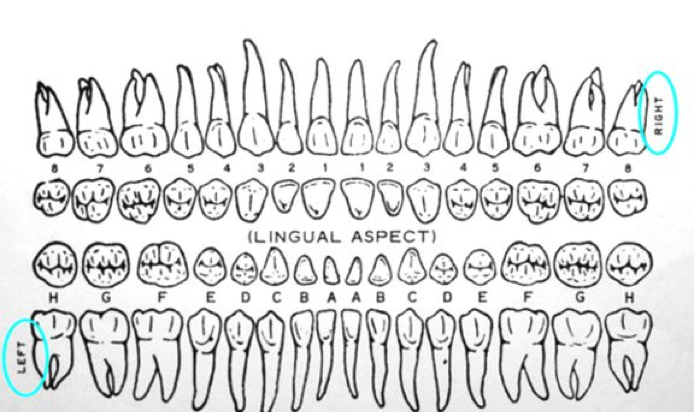 It is pretty obviously based on old denture tooth nomenclature but with variation--this chart uses numbers for the upper teeth and letters for the lowers, plus designation of "R" or "L". So, L3 is the UL cuspid and RF would be the LR 1st molar. I proudly say that I may be the only person in the world who is familiar with this charting system and actually must still use it from time to time. But would this necessarily be helpful to someone else?...maybe...maybe not... Additionally, it doesn't account for deciduous teeth. I don't want to be overly critical or too harsh, but please consider--would YOU want to make a critical clinical diagnosis on the basis of the images you just sent me? Sometimes an office will be, well, "reluctant," to release records to us--dentists in the U.S. usually citing H.I.P.A.A. concerns ("H.I.P.A.A." orPublic Law 104-191, 45 C.F.R 160). But there is actually an express provision in H.I.P.A.A. (section 164.512(g)(1) -- just Google "164.512") which permits release of records to a Medical Examiner/Coroner in order to ID a deceased person. And, further, in Texas we have a statute, Code of Criminal Procedure 63.006(e), which similarly absolves a dentist or physician from any liability--criminal or civil--for releasing dental records in these cases. Any M.E., Coroner, or Justice of the Peace requesting records should send a properly executed written request/order to the dental office. It is well established that the dentist actually owns the physical records, ﻿﻿but﻿﻿, the patient is entitled to a copy of the information contained in the records. Now, in this scenario the patient is ostensibly dead, and so cannot request records on his/her own behalf. Therefore, it is also well established that the Medical Examiner/Coroner can obtain those records on behalf of the patient. Simply put--if the M.E. wants the records--yes, the original records, not just copies--then the dental office will eventually have to turn those records over to the M.E./Coroner. Consult your attorney...and remember, I'm just the messenger.